As 2017 got underway, the question on everyone mind was if U.S. soybean acres would exceed corn acres. While this didn’t happen, the stage was set by more favorable prices and budget returns for soybeans. Given soybeans more favorable position for U.S. producers in recent years, we step back to review the global soybean production trends. As 2017 got underway, the question on everyone mind was if U.S. soybean acres would exceed corn acres. While this didn’t happen, the stage was set by more favorable prices and budget returns for soybeans. Given soybeans more favorable position for U.S. producers in recent years, we step back to review the global soybean production trends. This post builds off earlier work that considered corn (here and here) and beef trends (here). More specifically, this week’s post considered changes in global soybean production, the source of those increases, and the major players. Data from the USDA’s Foreign Agricultural Service Production, Supply, and Distribution database from 1990 to 2016 were summarized for this post. In Table 1, trends in soybean production for the top-ten counties (as of 2016) are shown. As many would expect, the U.S. and Brazil are in a neck-and-neck competition for the top spot. Collectively, these two counties accounted for 65% of total soybean production in 2016. Soybean production in Argentina, the third largest producer, is less than half of that in the U.S. or Brazil. 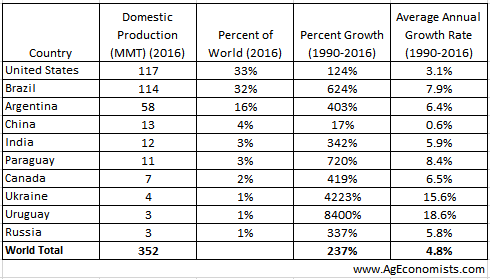 Globally, production increased more than 237% from 1990 to 2016. In annual terms, this is equal to an average rate of growth of 4.8%. It’s worth noting that in 1990, total world soybean production was 104 million metric tons, or less than what the U.S. or Brazil individually raised in 2016. Any story about growth in soybean production often highlights Brazil. 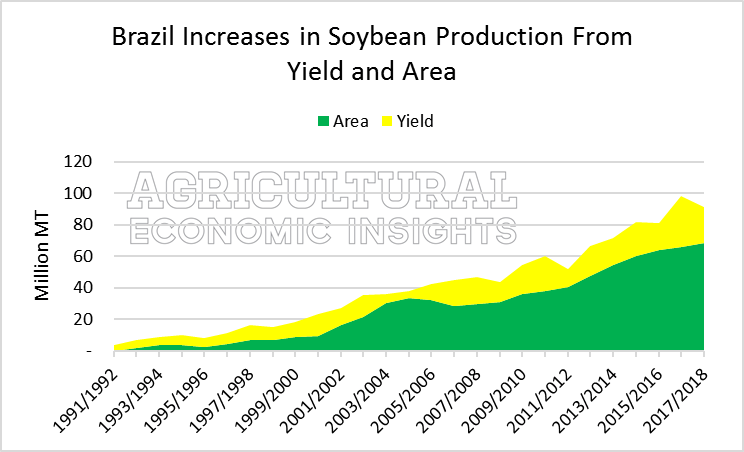 Growth in soybean production in Brazil increased at an average rate of 7.9% annually since 1990. This was more than double the U.S. growth rate. Moreover, Brazil’s increase in production accounted for 40% of the total global production increase (the U.S.’s increase in production was equal to 26% of the global increase in production; Argentina equal to 19%). Out of the top-ten counties, China stands out for having a very small increase in production (0.6%). We have noted this trend in earlier posts (here and here). It’s also worth noting that countries not typically synonymous with soybean production (India, Paraguay, and Canada) each accounted for a small share of total world production, but increased soybean production at a rate faster than the overall global trend. These counties could play a larger role in global markets in the future. In Brent’s earlier post he found that global corn production from 1990 to 2016 increased at an average rate of 3.0%. While the difference between corn growth (3.0% annually) and soybeans (4.8%) seems small and insignificant, the Rule of 72 tells us that at those growth rates, corn production would double every 24 years while soybean would double in only 15. These impacts can be significant over an entire career. Table 1. Total Domestic Soybean Production and Growth of Production from 1990 to 2016, Ten Largest Soybean Production Counties as of 2016. An important driver in increased soybean production has been an increase in harvested acres. In Table 2, the change in harvested soybean acres from 1990 to 2016 is shown. In 2016, Brazil and the U.S. accounted for 48% of total global soybean acres. While Brazil and the U.S. account for nearly half of all soybean acres (and more than half of all production), the change in acres has varied. In the U.S., soybean acres in 2016 were 46% larger than in 1990, or increased at an average annual rate of 1.5%. In Brazil, however, soybean acres increased 248%, or at an average rate of 4.9% annually. While Brazil’s expansion in soybean acres has been impressive, 6 counties in Table 2 actually posted larger average annual rates of growth in harvested soybean acres. Globally, soybean acres increased at an average annual rate of 3.1%, more than double corn’s 1.3% average increase in acres. Table 2. Total Acres of Soybeans Harvested and Changes in Acres Harvested in the Ten Largest Soybean Producing Counties as of 2016. Yield vs Area- Which Has Driven Production More? 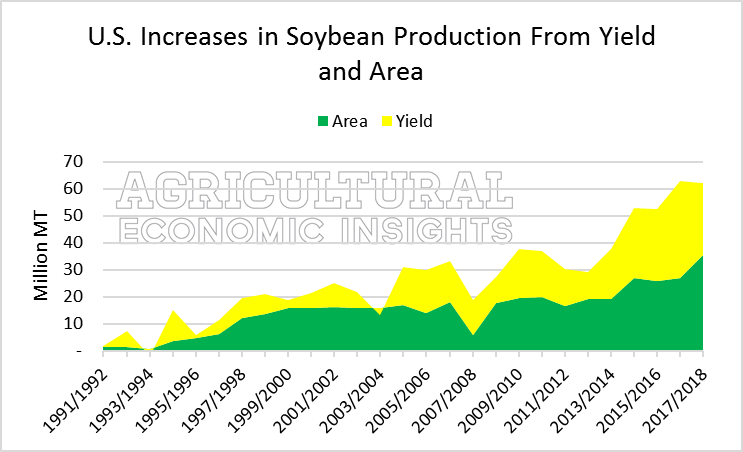 The second source of growth in soybean production is higher yields. Which of these factors, yields or acres, has driven production more? Consistent with earlier posts, the impacts of yields and acres were calculated by 1) holding area constant for a given year and calculating the yield impact, and then 2) holding yield constant and calculating the area impact. The combined impact is roughly equal to the total change in soybean production. Again, more sophisticated and precise methods for measuring these impacts could be used, but we’ll again stick with this approach. In figure 1 the area and yield impacts for global production over time are shown. Overall, 71% of production increases since 1990 have come from additional acres while 29% has come from higher yields. This is quite a different story from what was observed for corn. Over the same time period, gains in corn production were mostly achieved from higher yields (accounting for 56% of the production increase) rather than expanded acres (44% of the increase). Figure 1. Increase in World Soybean Production Due to Changes in Yield and Harvested Area, 1990-2016. Data Source: USDA’s FAS Production, Supply, and Distribution Database. The role yields and acres also varies across counties. In the U.S., yields have played a larger role as expanded acres accounted for 57% of production increases while increased yields have accounted for 43% (figure 2). In Brazil, expanded acres accounted for 75% of total production increases (figure 3). Figure 2. Increase in U.S. Soybean Production Due to Changes in Yield and Harvested Area, 1990-2016. Data Source: USDA’s FAS Production, Supply, and Distribution Database. Figure 3. Increase in Brazil Soybean Production Due to Changes in Yield and Harvested Area, 1990-2016. Data Source: USDA’s FAS Production, Supply, and Distribution Database. When looking at soybean production over 26 years a couple key observations standout. First, soybean production since 1990 expanded at an average rate of 4.8% annually. This rate was larger than that of corn production expansion over the same period. Second, the world is heavily reliant on the U.S. and Brazil for production. These countries accounted for 65% of production and 48% of acres in 2016. Furthermore, the combined increase in production for Brazil and the U.S. from 1990 to 2016 was equal to 66% of the increase in total global production. While yields drove most of the increase in world corn production (or 56% of the increase from 1990 to 2016), this has not been the case for soybeans. 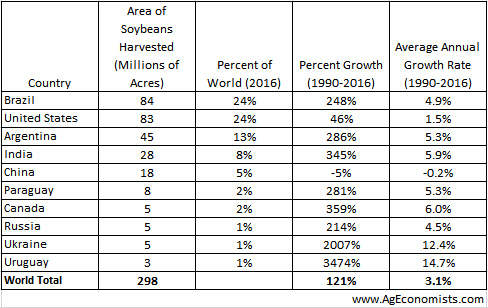 Over the same time frame, 71% of the total world increase in soybean production came from an increase in harvested acres. Acres played a smaller role in the U.S. (accounting for 57% of the increase in production) but a larger role in Brazil (75% of increased production). Looking ahead, these trends will be important to monitor. One key question is if growth of soybean production continues to be driven primarily from expanded acres of production. Additionally, should large rates of growth in currently smaller producing countries (Argentina, India, Paraguay) continue, these countries could play a larger role in soybean production (and perhaps exports) in the coming decades. What if CRP Acres Increased?